MQ Health is known for putting patients first, and through our education and research programs we focus on improving lives through application and generation of evidence. Improving lives and contributing to healthier communities is one of the most rewarding things you can do. 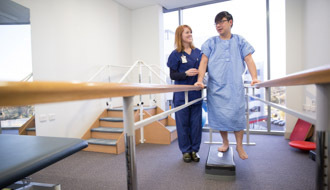 A career in physiotherapy is exciting and dynamic, and provides an opportunity to make a real difference. 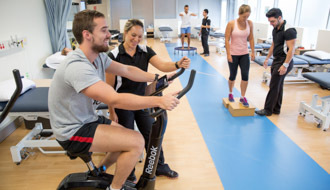 Macquarie University’s physiotherapy program aligns with international qualifications which offers you a unique pathway into a fantastic career. Macquarie University is the only place in NSW where you can attain a Doctor of Physiotherapy, and our course combines contemporary coursework with over 1,000 hours of supervised clinical placements. Students graduate with advanced clinical skills as well as business, management and leadership training and be ready to launch a fulfilling career as a physiotherapist across a broad range of health care settings. With a small intake of students, students receive one-to-one support and feedback throughout their study at Macquarie University. We have a great network of academic professionals who are experts in their fields of research, and together, we’re a vibrant community with a vision of being a world-class university health science centre. We put patients first to improve lives. To do this, our community of students and academics work with care and integrity. We’re ambitious to achieve our goals and we strive to engage with those outside the parameters of our university. Teaching into a number of undergraduate programs complements the postgraduate program teaching in the Department of Health Professions. We offer a Biomechanics of Human Movement unit for the Bachelor of Human Sciences and Bachelor of Clinical Science, and our Human Movement unit is the capstone for the Human Movement major in the Bachelor of Human Science. As one of the few physiotherapy programs commencing mid-year, graduates enter the profession at a time where fewer other physiotherapy graduates are entering the market. The Department of Health Professions leads internationally recognised research into common neurological, musculoskeletal and cardiorespiratory conditions and offers higher degree research programs for Masters and PhD degrees. Our department embodies the shared purpose of MQ Health - to heal, learn, discover. We put the patient first, and deliver clinical care, learning and research focused on progress through evidence.